Shahid Afridi is a Pakistani cricketer, who is famous for his aggressive batting style. 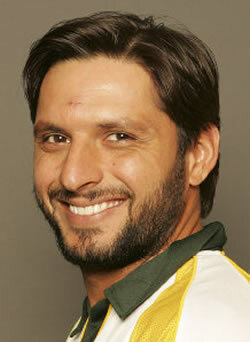 Shahid Afridi is a professional cricket player who was born on March 1, 1980 in Khyber Agency, Pakistan. His parents are of the Afridi tribe in Kohat; he is married to Nadia and has two daughters, Aqsa and Ansha. Nicknamed ‘Boom Boom Afridi’ for his aggressive batting style, Afridi is a brilliant all-rounder, as he is also a right-arm leg-spin or medium-paced bowler. In October 1998, he made his Test debut for the Pakistan team against Australia and became a reliable member of the team. His first appearance in ODI was on October 2, 1996 at Nairobi in a match played against the Kenya cricket team. He displayed a remarkable performance by scoring the fasted hundred runs in an ODI match, in 37 balls. Thus, he became an indispensable member of the Pakistani squad. He also beat the record of Sanath Jayasuriya, a famous Sri Lankan cricketer, on October 4, 1996. He was just 16 years when he performed this feat and was the youngest player to have achieved such an accomplishment. With Brian Lara, Afridi shares a joint record for scoring the third fastest ODI century, out of 45 balls against India in April 2005. By making four of the top eight fastest ODI half centuries, he has made a mark for himself in the history of ODI cricket. In 2007, he scored 32 runs (including four consecutive sixes) off six balls against Sri Lanka at Abu Dhabi. The over was bowled by Malinga Bandara which is considered to the second most expensive over in the ODI history. In March 2005, his Test performance with the bat and ball played a key role in Pakistan’s encounter against India. Shahid Afridi made 50 runs out of 26 balls and walked away with three wickets in the second innings of a Test match claiming the victory for his team and brought the series to a draw. In January 2006, he smashed four consecutive sixes against Harbhajan Singh’s bowling in a Test match against India. On achieving a combination of 5000 runs and 200 wickets, Shahid Afridi is the third player (after Sanath Jayasuriya and Jacques Kallis, a South African cricketer) to accomplish such a feat in ODI history. For his commendable performances as a bowler of the Pakistan team in the international 2007 Twenty20, Shahid Afridi earned the Man of the Series award. He represented the Deccan Chargers (DC) team under the captaincy of VVS Laxman, an Indian cricketer, in the Indian Premier League (IPL) of 2008. His sign-in price was $675,000 and he played thirty matches for the DC team. Shahid Afridi scored 367 runs, which included 32 boundaries and 21 sixes with a strike rate of 171.49. By taking 35 wickets, the bowling average of Shahid Afridi was 20.05 at an economy rate of 6.81.